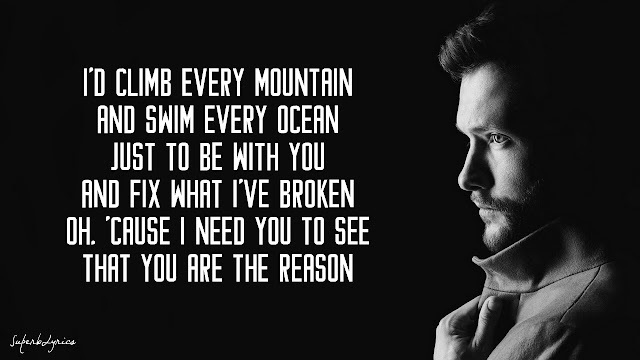 You are the Reason by Calum Scott have deeply touched my soul especially when I heard it played during one of our HIV Seminar in our company. YOU ARE THE REASON is a song for everyone to be GOD's Blessing for those who needS help and for people that feel broken with their lives. "I'd Climb every Mountain and Swim every Ocean just to be with YOU and FIX what I've broken Oh. Cause I need you to see that YOU ARE THE REASON"
At first I got confused by its words but as I let it replay It hides the true meaning of the songs. This is not just a song for an HIV Positive but for everyone. Everyone that needs GOD's Guidance and Confess to our own sin and be with HIM again. We make mistakes. Everyone does it. But always remember that there will be someone behind us that will always be our reason to survive a new life that has give to us again even we have tinted our soul. We may not look clean to others eyes but with God, we are all GOOD and CLEAN. BE THE REASON TO SOMEONE'S STRENGTH AND ALWAYS BELIEVE THAT GOD PROTECTS OUR SOULS ALL THE TIME.